How many of you guys are familiar with the Belkin N52TE? Well just recently Razer has bought it from Belkin and it will now be under Razer’s logo. What is this exactly? This is basically a separate “game pad” meant for gaming. 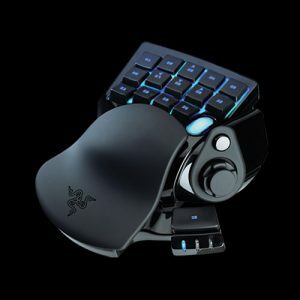 Many people still use their keyboards regularly to play games but the Nostromo delivers the same experience but without the excess key clutter. This game pad is more suited for FPS (First person shooter) games and maybe even World of Warcraft (MMO’s massively multiplayer online games) but I fear there may be too few buttons on it for WoW. More after the specs. I just want to mention first that I have never used one of these contraptions before and I’m only semi interested. Why? Well because there is just one major thing I have against the layout. Most importantly of all, you can clearly see that after the initial up/down/left/right keys, there is no number row! (As in 1,2,3,4,5 etc) In my eyes this is such a design big flaw because so many games out there utilize the efficiency of 1-5 which is within normal human reach. In the days I have played WoW I have had so many keybinds mainly because there were so many skills and things I needed to keep track of. First I used the normal number row which is 1 to =. Then after that I had keybinds for Ctrl/Alt/Shift + (1 to =) and even F1 to F12. I then eventually took some keybinds and moved them to my mouse at the time (Logitech G500) which were more of my panic buttons which allowed me to escape from a situation or heal/etc. Think of your mouse and how many buttons on the keyboard it could replace. Not many right? (Well unless you own a Razer Naga…)Therefore I still had the same problem with too many keybinds. The Nostromo’s keys are all interchangeable meaning that you can map them to any key or combination of keys you want. Could this be an improvement dare I say? Well I can’t judge fairly but I think the majority of gamers coming from their usual plethora of keybinds will have a larger learning curve to set up all their keybinds on a new device. In the end this is just another fancy peripheral to keep your eyes open for. If anyone does have one of these devices, send me an email and tell me your opinion on it. Plus let me know if you guys would like to see a review of this.